Peptide (C)KE(S)VKFGGKLVGNN, corresponding to amino acid residues 672-685 of rat NBCe1 (Accession Q9JI66). 2nd extracellular loop, based on the 10 transmembrane topology. Homology Rat - 13/14 amino acid residues identical; mouse - 12/14 amino acid residues identical. 1. Anti-SLC4A4 (NBC1) (extracellular) Antibody (#ANT-075), (1:200). 2. Anti-SLC4A4 (NBC1) (extracellular) Antibody, preincubated with the control peptide antigen. 1. Anti-SLC4A4 (NBC1) (extracellular) Antibody (#ANT-075), (1:400). Immunohistochemical staining of immersion-fixed, free floating rat brain frozen sections using Anti-SLC4A4 (NBC1) (extracellular) Antibody (#ANT-075), (1:400). 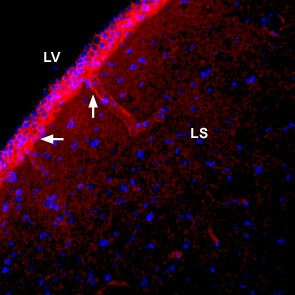 NBCe1 staining (red) is detected in blood vessel outlines (vertical arrow) in the lateral septum (LS) and along the wall of the lateral ventricle (LV) (horizontal arrow). DAPI is used as the counterstain (blue). Cell surface detection of NBC1 in live intact rat PC12 pheochromocytoma cells. A. Extracellular staining of cells with Anti-SLC4A4 (NBC1) (extracellular) Antibody (#ANT-075), (1:100), followed by goat anti-rabbit-AlexaFluor-594 secondary antibody (red). B. Live image of the cells. C. Merge of the two images. Romero, M.F. et al. (2013) Mol. Aspects Med. 34,159. Abuladze, N. et al. (2000) Gene 251, 109. Zhu, Q. et al. (2010) J. Biol. Chem. 285, 13416. Kao, L. et al. (2008) J. Biol. Chem. 283, 26782. Igarashi, T. et al. (1999) Nat. Genet. 23, 264. SLC4 membrane transporter proteins play important roles in kidney acid–base regulation through their transport of bicarbonate (or carbonate), Na‏+, Cl-, and (possibly NH4+)1. These transporters differ in their substrate (Na+‏, Cl-) dependence, charge transport stoichiometry, cell-type and developmental expression, functional regulation, and protein–protein interactions. In mammals, SLC4 proteins are encoded by 10 different genes that share protein sequence homology and are grouped according to their functional properties. In humans, the electrogenic sodium bicarbonate cotransporter NBCe1 is encoded by the SLC4A4 gene2. NBCe1-A has a large N-terminal cytoplasmic region, a lipid embedded transmembrane region, and a C-terminal cytoplasmic tail3. The N-terminal cytoplasmic region is tightly folded and is predicted to form a domain structure, unlike the freely aqueous accessible C-terminal cytoplasmic tail. NBCe1-A is composed of either 10 or 14 transmembrane domains. Based on the 10 transmembrane topology, a large extracellular loop (EL) is present between TM3 and TM4 and contains two glycosylated sites. The oligomeric state of the cotransporter is dimeric and each monomeric subunit has independent transport activity4. Mutations in NBCe1 cause autosomal recessive proximal renal tubular acidosis (pRTA). Patients with NBCe1 mutations have severe pRTA, growth and mental retardation, basal ganglia calcification, cataracts, corneal opacities (band keratopathy), glaucoma, elevated serum amylase and lipase, and defects in the enamel consistent with amelogenesis imperfect3. Mice with loss of NBCe1 have a more severe phenotype with marked volume deletion and decreased survival5. Alomone Labs is pleased to offer a highly specific antibody directed against an extracellular epitope of rat NBCe1. Anti-SLC4A4 (NBC1) (extracellular) Antibody (#ANT-075) can be used in western blot, immunohistochemistry and live cell imaging applications. The antibody was used to probe NBCe1 in living rat PC12 cells. It has been designed to recognize NBCe1 from rat and mouse samples and is not recommended for use in human samples.